When Denmark kicks off against Poland in their 2018 World Cup qualifier tonight at Telia Parken Stadium, they will do so with their backs against the wall. With just four games to go, the Danes sit in third place in Group E with ten points, behind Montenegro on goal difference, and six points adrift of the indomitable Poles. There is little doubt that only three points will suffice should Denmark want to partake in the fun in Russia next summer. “I think it’s a given that we must beat Poland if we want to catch them or be good enough to finish runner-up. It’s the first of four finals,” Simon Kjær, Denmark’s captain, told sn.dk. Arguably the toughest of the four ‘finals’ will be tonight. Since slumping to a 2-2 draw against Kazakhstan in their first match, the Poles have won five on the trot – including a 3-2 win against the Danes in Warsaw. Striker Robert Lewandowski torched the Danes that night with a hat-trick and with 11 goals in six games the Bayern Munich star will be key tonight as well. 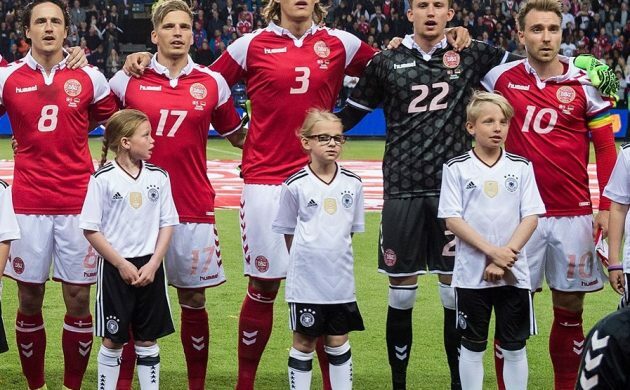 The good news is that Denmark is playing at home in front of a sell-out crowd – the first time that has happened for a while – and usually that has helped the Danes against the toughest of adversaries. Oh yeah, and Nicklas Bendtner is back for the first time since 2015. So there’s that too. The remainder of Denmark’s ‘finals’ take them away to Armenia on Monday, away to Montenegro on October 5 and home to Romania on October 8. Kick-off tonight is at 20:45 and the match will be shown on Kanal 5. Christian Eriksen and company can draw inspiration from the younger boys. The Under-21 squad beat the Faroe Islands 3-0 away last night in the Euro 19 qualifiers in Group 3. Marcus Ingvartsen, Rasmus Nissen and Mathias Jensen got the goals for the Danes in a group that also features Poland. Up next for the Danes is Lithuania at home on September 5. Following his World Championship triumph in the men’s singles in Glasgow last weekend, Denmark’s top badminton man Viktor Axelsen has moved up in the World Rankings to number two just behind Son Wan-Ho of South Korea. Axelsen beat Chinses legend Lin Dan 22-20, 21-16 in the final to become the first Danish world champion in men’s singles since Peter Rasmussen won it in 1997 – coincidentally also in Glasgow. Caroline Wozniacki couldn’t repeat the sterling run she managed last year in the US Open, as she fell 2-6, 7-6, 1-6 to Russian upstart Ekaterina Makarova in the second round. The fifth-seeded Dane then followed up her loss by complaining she had to play on the outer courts while unranked Maria Sharapova was able to play in the Arthur Ashe Stadium. “I understand completely the business side of things and everything, but someone who comes back from a drug sentence and then all of a sudden gets to play every single match on Centre Court, I think that’s a questionable thing to do,” she told reporters. The Danish broadcaster TV3 has secured the services of former England and Liverpool legend Jamie Carragher as a TV pundit. Carragher will cover the Champions League for the TV3 network, and he will make his ‘debut’ when Liverpool take on Sevilla on September 13. The move continues TV3’s recent policy of including English-language pundits and presenters in its coverage.